On June 30, 2017, Myanmar foreign minister Aung San Suu Kyi, a Zionist poodle, and 1991 Nobel Peace Prize winner, ordered her ministry to reject visa requests from UN investigators appointed to report on the military’s alleged human rights atrocities against Rohingya Muslims in Shan, Kachin, and Rakhine states. “We will order Myanmar embassies not to grant any visa to UN fact finding mission members. They would have to carry out their mission by visiting neighboring countries,” said deputy foreign affairs minister Kyaw Tin. In March 2017, the United Nations Human Rights Council (UNHRC) appointed a panel of three to investigate and report to the international body about the ethnic-cleansing of Muslim community carried out by the country’s Buddhist army. Learning from its experience with the Zionist regime, UNHRC, appointed three non-Muslims; Indian lawyer Indira Jaising, Sri Lanka’s former human rights chief Radhika Coomaraswamy, and Australian human rights advocate Christopher Dominic Sidoti to carry out the investigation. General Min Aung Hlaing, commander-in-chief of the Myanmar Armed Forces, visited the Zionist entity in September 2015. He met his Israeli counterpart Gen. Moshe Ya’alon to discuss enhancing military and intelligence cooperation between the two anti-Muslim regimes. 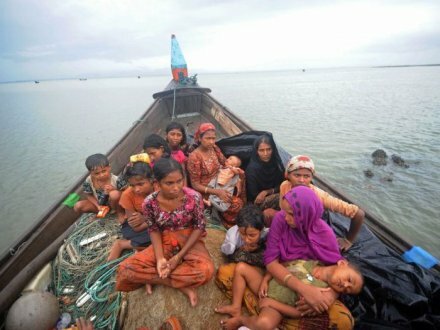 In April 2013, American writer, author and blogger, Mark Mason, in an interview with Press TV claimed that Burmese (Myanmar) army buys Israeli arms and is trained by Israelis to carry-on ethnic-cleansing of Muslims based on Israeli ethnic-cleansing model of Palestinian Muslims and Christians. Aung San Suu Kyi’s National League for Democracy came to power after 2015 elections. Last year, our former foreign minister Stephane Dion visited Myanmar on invitation from Aung San Suu Kyi. And finally, meet professor Imtiyaz Yusuf, a self-denial Muslim, who advise 480 million Muslims living Southeast Asia to study Buddhism followed by 240 million people in the same region to live peace together.